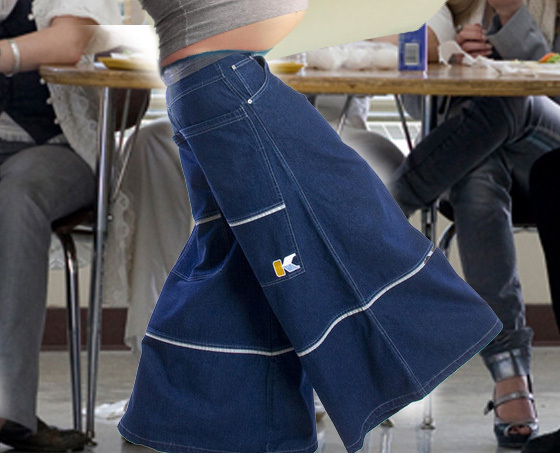 School officials nationwide report that students are buying ‘JNCO jeans in record numbers’. Suddenly, students are “skipping class, playing hackey-sack, listening to grunge music and pounding down Surge! and marijuana cocktails”. The morally bereft culture of Clinton-era high schools is haunting America again and JNCO Jeans are to blame. .During the late 90s parents may remember a destructive clothing style called ‘JNCO’ jeans. These jeans infested suburban high school suburbia, bringing vato barrio fashions and lifestyle to ordinarily innocent youths in America. But only one week ago reports of the rebellious clothing styles return and eventual demand in suburban high schools came through the news wire. In this modern age, it is already tough for parents to navigate and steer their children to successful, productive lifestyles that fall into the order our Puritan founding fathers set forth in precedent for this great nation. But these days, every other song students hear encourages them to engage in wanton carnality, freely exploring Quualudes and Nickelback roofies to loosen their bodies and allow exhausted sins to take place after marathon EDM concern sessions on the weekends. Sure, parents think it’s just Friday Night Lights at the local football field, but instead little Jenny and Sally are rushing off to these all night raver concerns where they’ll encounter all sorts of dangers as listed in our chart below. It is already bad enough that Big Marijuana rears its ugly head all over suburban high schools nationwide. A record number of high school students are doing dope and having car crashes from their drugged driving. The statistics become even more troubling when you find that for every five students who try marijuana, 3 of them will become pregnant. The survey indicates that 51% of high school students have tried the drug, meaning that over 30% of high school students are already at risk for marijuana. We have other risks such as EDM concerns, At-risk transfer students lusting after fit, healthy and morally chaste suburban young women and then birth control classes teaching ‘if you just pop a pill or rubber, it’s all fine’. But beyond expectation, we find JNCO Jeans topping the list. Some high schools during the 90s reported a near 80% ‘at risk’ level for their students becoming pregnant. The common factor: JNCO Jeans. The loose, comfortable fit of the jeans produces sinful thoughts and antics, as it allows veiled access as proper pants would not normally allow. It’s thought when students skip class to play Pogs and Pokemon, their Surge! marijuana brains are lusty and touchy, all encouraging them to implementing touching games that are leading to pregnancy. If you catch your high school student with these jeans, it is advisable to just burn them and make sure they are wearing proper clothing. Do spot checks on them at school if necessary, because the last thing we need is for this nation to make a return to the morally bereft Clinton era.